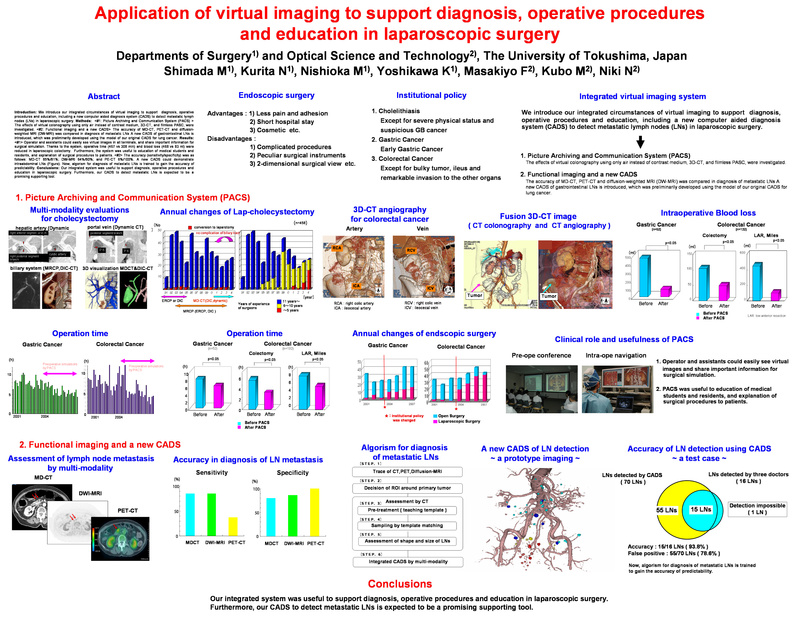 Introduction: We introduce our integrated circumstances of virtual imaging to support diagnosis, operative procedures and education, including a new computer aided diagnosis system (CADS) to detect metastatic lymph nodes (LNs) in laparoscopic surgery. Methods: The effects of virtual colonography using only air instead of contrast medium, 3D-CT, and filmless PASC, were investigated. The accuracy of MD-CT, PET-CT and diffusion-weighted MRI (DW-MRI) was compared in diagnosis of metastatic LNs A new CADS of gastrointestinal LNs is introduced, which was preliminarily developed using the model of our original CADS for lung cancer. Results: Operator and assistants could easily see virtual images in all terminals, and share important information for surgical simulation. Thanks to the system, operative time (467 vs 308 min) and blood loss (468 vs 83 ml) were reduced in laparoscopic colectomy. Furthermore, the system was useful to education of medical students and residents, and explanation of surgical procedures to patients. The accuracy (sensitivity/specificity) was as follows: MD-CT 85%/81%; DW-MRI 64%/90%; and PE-CT 6%/100%. A new CADS could demonstrate intraabdominal LNs (Figure). Now, algorism for diagnosis of metastatic LNs is trained to gain the accuracy of predictability. Conclusions: Our integrated system was useful to support diagnosis, operative procedures and education in laparoscopic surgery. Furthermore, our CADS to detect metastatic LNs is expected to be a promising supporting tool.